Panel Transcript: Is There a STEM Worker Shortage? It’s been almost a year since the passage of the Schumer-Rubio immigration bill in the Senate, and in the lead-up to that and since then a lot of different aspects of immigration have gotten extensive discussion and debate: the question of amnesty, border security, visa tracking, website – I mean worksite enforcement. Deportation policy has been pretty hot recently. But there’s been a relative lack of discussion over the proposed increases in technology – worker science and technology visas. And that – some people might suggest that there’s really nothing to debate, that everybody agrees and that’s almost an afterthought. Many of the Republicans otherwise skeptical of so-called comprehensive immigration reform are prone to support pretty much any proposal to increase tech visas, whether it’s temporary or permanent. If the House passes any immigration bills this year, which may actually – I’m thinking it probably won’t happen, but if it does it will – there will be some kind of tech visa legislation considered, and all the more if the Republicans take the Senate next year and keep the House. There seems to be very likely to be some tech visa increases passed, if not finally signed. But the case for increasing the admission of science and technology workers isn’t quite as clear-cut as all of that would suggest, and that’s what this panel is about today. And we have a pretty – I think a pretty interesting line up. First is going to be Steve Camarota, who is the coauthor with Karen Zeigler of the report that’s out there, that you should have a copy of, on the size of the STEM – science, technology, engineering and mathematics – workforce and the wage trends. It’s supposed to be online at cis.org and it is, but cis.org doesn’t seem to be online, so there’s – (laughter) – when the website’s back up the report will be there front and center. And then commenting both on the report and sort of more generally on the issue of science and technology immigration, we have two of the top people in the country, really, who have written and talked and thought about this. First is Michael Teitelbaum, who is a senior research associate at the Labor and Worklife Program at Harvard Law School – was until not that long ago at the Sloan Foundation, which funds a lot of research into the issue of a science and tech workforce. And Michael is the author of “Falling Behind: Boom, Bust and the Global Race for Scientific Talent,” which has been – which is just out from Princeton University Press and has been pretty – it’s been favorably reviewed. The other commenter is Lindsay Lowell. He’s at the Institute for the Study of International Migration at Georgetown and has written extensively on this issue of science and tech migration as well. So we’ll start with Steve, then Michael and Lindsay will have their say, and then we’ll take Q&A. I’ll just remind you afterwards as well, but when we get to Q&A please wait for the mic before you ask your question. 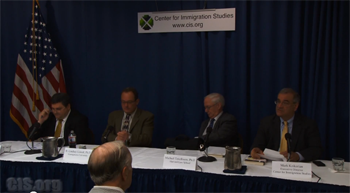 STEVEN CAMAROTA: Well, thank you, Mark, and thank you all for coming to the Center for Immigration Studies discussion of our new report on STEM workers. The report is available. If you don’t have it, it will be online, as Mark said, at cis.org. Now, the idea that we need to allow in more STEM workers – that is, science, technology, engineering and math, people with those kinds of degrees – has become a kind of article of faith among many elites in American business and politics. In the new report we are releasing today, my colleague Karen Ziegler and I analyzed the latest government data and find, really, what most other researchers have found: The country has well more than twice as many people or workers with STEM degrees as there are actual STEM jobs. Also consistent with other research, we find only modest levels of wage growth for such workers for more than a decade. Both the employment and wage data indicate that such workers are not in short supply. Now, RAND’s analysis was interesting because it wasn’t just looking at what was going on at the time of the study. Theirs was backward-looking. And RAND concluded, despite recurring concerns about a potential shortage of STEM personnel, we find – this is RAND’s words – we find no evidence that such shortages have existed at least since 1990, nor that they are on the horizon. When Karen and I looked at the latest data from the Census Bureau, we found the following: In 2012 there were more than twice as many people, as I said, with STEM degrees than there are STEM jobs. There are about 5.3 million STEM jobs in the United States, or people working in a STEM job, and over 12 million people with a STEM degree. Only one-third of native-born people, or U.S.-born if you like that term better, who have a STEM degree actually have a STEM job of any kind. There are 1.5 million U.S.-born people with an engineering degree not working as engineers, as well as half-a-million with technology degrees not working in their field, 400,000 with math degrees working outside their field, and 2.6 million with science degrees working outside of STEM as well. In addition, there are 1.2 million native-born people with STEM degrees who aren’t working. They’re either unemployed or entirely out of the labor market. Now, it is true that unemployment – that is the share of people who have a STEM degree and say they’re looking for a job actively; they don’t have one and looking – is low, but it’s low for all people with college degrees. There’s nothing particularly unusual. It does seem that one thing is people with college degrees don’t like to admit that they’re unemployed or say that they’re unemployed in the government data. And this is true regardless of your degree, and it’s certainly true that unemployment per se is not high among STEM workers. Now, turning to immigrants, it is also the case that less than half of immigrants with a STEM degree actually have a STEM job. In particular I find this interesting: Just 23 percent of all engineers with – immigrants with engineering degrees actually work as engineers. Of the 700,000 immigration STEM workers the data show entered between 2007 and 2012, only one-third – very similar to that figure for natives overall – actually got a STEM job. About one-third got a job outside of STEM and actually about one-third aren’t working at all. The fact that so many recent immigrants with STEM degrees did not find STEM jobs is a clear indication that certainly immigration is a very inefficient tool for adding to the STEM workforce. Most immigrants that we allow in, at least in the recent past, with STEM degrees are not becoming STEM workers. Now, one other point about the supply of STEM workers that sometimes gets missed is that of all the people holding a STEM job in the United States, 31 percent report that they don’t have a STEM degree, which reminds us of something – there’s about – there’s about 1.6 million of them – that the STEM workforce is much more flexible than sometimes supposed. Some people who don’t get a STEM degree can often do STEM work. This is especially true in technology and computer fields, but it’s also true often in science and a lesser extent in math and engineering. But in all those places there are people who didn’t get a degree in that area who do that work, and there are people who have no STEM degree who do that work. Now, as I say, it’s true that unemployment is not high. However, there are a large number of STEM degree holders entirely out of the labor market, about 1.3 million total immigrant and natives. You can see almost all of these figures just shown in Table 1. But what I think is – what is important about the enormous number of people, immigrant and native, who are not working in STEM jobs is that this is a huge supply of people who are already here and already trained who employers can draw upon. I mean, another way to think about the STEM worker shortage, of course, in addition to all these people who are STEM trained but not STEM workers, is wages. Wages are one of the best measures of labor demand. If STEM workers are in short supply, as you would learn on the first day of economics, wages should be increasing rapidly as employers try desperately to offer compensation in an effort to retain the workers they have or to find workers in a limited supply. That’s what should be happening. But wage data from multiple sources show little wage growth, or very modest wage growth, over the last 12 years. In our report we estimated that wages for STEM workers overall, hourly wages – so that controls for how many hours a week you work – increased on average for the last 12 years about .7 percent, or less than 1 percent, and for annual wages they grew by about .4 percent. So that’s less than one-half of 1 percent on average a year. I should point out that wage growth is very modest for almost every subcategory of STEM workers, even when we drill down in and look at specific types of engineers or specific types of people who work with computers. You can see all of that in Figures 7 and 8, or the general trends. And then if you really want to immerse yourself in the data you can look at Figures A7 and A8, beginning on page 32 of the appendix at the end of the report. MR. CAMAROTA: Petroleum engineers. Their wages grew 10 times faster than all other STEM workers, for the obvious reason that the fracking boom has created an enormous demand. And when you have demand-driven wage increases, it does show up in the data. And that’s one of the two things I think that tells us the data is able to capture wage growth even among a modest number of people, and it is also the case that it shows something else that we may find shocking, but that the market actually worked. You got wage growth when you had massive increases in demand. That has been lacking generally, or it’s not the case that the supply is somehow being outstripped by demand. And so you don’t have that with STEM generally but you certainly have it with petroleum engineers. Their wages are up, like, $50,000, adjusted for inflation, in the last 12 years. So if there really is this super abundance of native and immigrant STEM workers already here, little wage growth and STEM immigration actually already exceeds the absorption capacity of STEM labor, why are there continual calls to allow in more STEM workers? Well, I think the answer – I don’t want to put it too simply – is two things: greed and politics, nothing that should surprise us here in this city. The businesses that want more immigration would like to get more workers to choose from, holding wages in check and increasing their bargaining power over employees. From their point of view, what’s not to like? The Republicans, who generally listen to their corporate donors in Silicon Valley and elsewhere – it’s not just Silicon Valley – and they respond by promising to increase STEM immigration even further. The motives of the Democrats are a little more complicated. They like the corporate donations as well, but even better they see increasing STEM immigration as essentially a bargaining chip to get what they really want from Republicans, which is an amnesty, a legalization for illegal immigrants. Democratic Representative Luis Gutierrez has basically said as much, and that’s essentially the way they see it: We’ll give – the Republicans will get their STEM and the corporate donations that they like and we’ll get our legalization. That’s the tradeoff. But in addition to this kind of collusion, if you will, between the two parties to push for more STEM, there are other reasons why the STEM worker shortage is given credence despite all this evidence, not just from us but from others, to the contrary. And I think one of the reasons – and Lindsay is an expert in this area, or knows a great deal about it, so if you have a lot more questions you might want to ask him, but one of the reasons is the generally poor performance of American school students in science and math relative to other first-world countries. These test scores, which constantly get reported on, create the perception that we are not producing enough scientists and engineers. Now, low relative average tests scores are certainly troubling, but as the EPI study – and Lindsay was one of the authors of that study – mentioned above makes clear, this does not prevent us from producing a large number of high-quality STEM students. America is a huge country and the STEM workforce is relatively small. For example, it only grew by a million people in the last 12 years. This is well less than 5 percent of the 20 million students – or more than 20 million students who actually got a bachelor’s degree in the last 12 years, and that’s not counting the millions more who got graduate degrees. Producing a small number of high-quality STEM workers out of this enormous population isn’t very hard. And I’ve already said most Americans who get the STEM degrees actually don’t even get the STEM jobs. We’re actually producing too many out of that large population. Now, another reason for the “why we need more STEM workers” argument is taken seriously is that it is endorsed by many of Americans, most – many of America’s most prominent billionaires entrepreneurs such as Bill Gates or Mark Zuckerberg. They’re seen as very smart, so what they want must be good for the country. What’s funny about that is their vested interest in holding down wages and improving their bargaining power vis-à-vis their workers that comes from increasing STEM often goes unmentioned. And unfortunately, too many in the media just simply transcribe their press releases. It would probably be the case to say that when hedge fund managers argue that their incomes should be taxed at the lower capital gains rate rather than the income tax rate, stories about their lobbying efforts include their vested interests – how much money this would save them. But it is an odd fact, or maybe not so odd, that often stories about political pressure to increase STEM immigration doesn’t include the – a discussion of the vested interests of the employers who are paying for that lobby. Now, despite this bandwagon, let me – let me talk about what I think are some potential problems with allowing ever-more foreign STEM workers into the country. And the number is already very large, but let’s talk about what might be a problem. First, the argument itself for doing so is disingenuous at best and dishonest at worst, and it’s never a good idea to base public policy on a deception of the public. Second, there are still – these are still mostly middle-class jobs, and a large number of American students getting STEM degrees are not finding the STEM jobs for which they trained. Over this – over the last few years, in fact – this fact over the last few years, coupled with the lack of wage growth, can only over time deter American kids in the future from going into these fields and getting these middle-class jobs. Another reason is – another concern I have is that STEM workers are vital to national security, and having a large share of our STEM workforce foreign-born does have important national security implications to think about. Fourth, allowing American industry to become dependent on foreign sources of skilled labor means industry quite frankly just becomes increasingly indifferent to any problems that exist in our schools, making it less likely that these problems will ever be fixed. In other words, businesses are one of the most important lobbying or political entities in the United States. That’s true at the state level. It’s true at the local level. It’s true at the national level. If you say – if they say, well, you know, yeah, maybe we’re not teaching enough math and science but that doesn’t affect me because I get my labor from overseas, it seems much less likely that they’re going to take any new – the kind of interest they would in American schools than if we say, look, you’ve got to rely on a basically U.S. workforce. And so I think that’s a potential kind of long-term problem, to make American business more indifferent to what’s going on in American schools. Let me just say, in conclusion, look, there may be specific geographical areas or a highly technical specialized field in which demand really is outstripping supply. However, it makes little sense to allow broad public policy to be driven by these very narrow interests. If there is some special need in a highly technical field, then perhaps a narrowly focused immigration program is called for. But, overall, the data indicates that the supply of STEM workers vastly exceeds the number of STEM jobs and there has been only modest wage growth in these professions, a clear indication that the supply of workers is not outstripping demand – or the demand is not outstripping supply. And in my view, these facts are what should inform and shape immigration policy moving forward. Thank you. B. LINDSAY LOWELL: How much time do I have? MR. KRIKORIAN: I don’t know, 10 minutes or so. MR. LOWELL: OK, 10 whole minutes. I’ll see if I can do that. Thank you. It’s good to be here this morning. Yes, I’ve spent a lot of time thinking about whether or not there are shortages in STEM and a fair amount of time looking at the immigrant side of that, but also what is called the pipeline. That is the number of students coming through the process. And there, over four decades, a lot of the basic things we learn about the STEM labor market, the pipeline, don’t seem to be true. About a third in the – in recent years even more of incoming freshmen are interested in STEM. There’s not been a loss of interest. Test-taking has actually improved. The number of courses being taken at the high school level have improved. In the United States, we’re often concerned about how poorly we seem to do on international tests like the PISA and what not. Having said that, we have, the United States, about a third of the top two quintile performing students on international tests on science. So that’s kind of an important fact because the numbers are exactly the way Steve said. If you look at a high school cohort, about 4 percent, at the end, will end up with a STEM degree. Maybe 2 ½ percent will actually end up in a STEM job. That’s amazing, isn’t it, 2 ½ percent out of a graduating high school class. So if we have a third of the world’s highly qualified, (I test ? ), students in the United States at the high school level, we’ve got plenty of ability to supply the pipeline. What we need is a correct set of signals going all the way down the pipeline to make that happen. Now, I’ll be talking this afternoon at a different venue. Clearly, there’s a lot we need to do to improve the STEM pipeline. Clearly, we need to reach out to minorities and bring underrepresented minorities and women into STEM. There’s a lot of challenges. So I’m not saying the STEM pipeline doesn’t have issues. But the potential is really there. As for the indicator of shortages in the labor market, you do get these kind of disconcerting things that we just heard about, which is, you know, large numbers of individuals with degrees who aren’t actually working in STEM jobs. And that one’s kind of a trickier nut, for lots of different reasons. One of the things I hadn’t seen, though, was what Steve also said, 700,000 arrivals over better than a decade of foreigners with STEM degrees. MR. CAMAROTA: Well, that’s 2009 to 2012 – or 2007 to 2012. MR. LOWELL: 2000 – 700 – OK, 2007. Only one-third are actually working in STEM. One-third are working outside of STEM, and one-third are not working at all, which is kind of amazing. It is a fairly inefficient system for supplying the STEM labor market. And that little factoid alone is something I want to investigate a lot more carefully. Let me just kind of make some other comments on this. So one of the things people are saying is they look at the data. Wages aren’t growing, employment aren’t – isn’t growing that rapidly. So there doesn’t seem to be a lot of shortage. And people have started redefining what it means to be STEM. And in that context, you’ve got STEM everywhere, 4 percent of agricultural workers employ math, and so therefore they’re STEM. Physics degree holders driving taxis earn more than other taxi drivers, so clearly, they’re using their skills. (Laughter.) I think it’s a slippery slope empirically to start moving our definition of what it means to be STEM. I don’t think STEM is everywhere. When we’re educating people for STEM, I think we want them to get STEM jobs, by and large. When we’re admitting foreign workers to be in STEM, we want them to work in STEM. So why is the perception there? You’ve heard some from Steve. Let me point out a few others, one of which – and some of these, I think, are very well-intentioned viewpoints. And the well-intention – the viewpoint is so strong that the – a lot of the data points are brushed aside. One of those is – I read a piece written in 1900 about somebody who said we have to train everybody in science. This is at a time when 8 percent of the U.S. population had a high school degree. Everybody should be trained in science because in a modern world, you have to have science to be able to participate in politics. You have to understand how the world works. So the science citizenry perspective is out there, and it has a lot of legs. The other is innovation, which is part and parcel of this idea that all education is good, even though we’ve got – I hate to say it – some reasonable suggestions that we almost overeducate our population. So this mismatch between degree and job isn’t necessarily unique to STEM. We need to rethink how we do our education in the United States fairly thoroughly. Part of the concern here is also what I’d call U.S. dominance, what Bhagwati called America’s fear of being a diminished giant. And so the idea is if you throw enough STEM at it, the economy will grow. I’m not a supply-sider in that way. I think if there’s not demand, you can’t just grow an economy by increasing the level of education. It’s a fine – it’s a fine marriage between the two. So why do we have these perceptions otherwise? Well, employers clearly have a vested interest, but it’s not clear to me that they often see that’s why they’re acting. In other words, they look out there, and they say it’s hard to find these workers. Sure it is. It’s hard to find highly skilled workers. That’s true. But when you look at the same surveys, you know what’s interesting? Employees say, I can’t find people with soft skills, who work in teams, who can write, who can do a memo, who can think well. In other words, our education system isn’t producing the soft skills that employers often are looking for, not – we’re not talking technical skills. And you can see that most interestingly especially in IT, where a large proportion of the labor force has no STEM backgrounds, and they’re working in this field, have picked up the skills along the way, in some other ways. They’re getting it through certificates. But they bring the right combination of soft and programming skills to the employer. Employers don’t train anymore. There is a culture of expectations about just in time, and that’s changed. There’s also perils of training. You train them, and they can command a better job someplace else, and they do. It’s a very mobile, high-turnover labor market. And you can see this when people talk about vacancies. Vacancies are large. One of my – the interesting factoids, in 2000, ITAA came out with an estimate of 400,000 vacancies in IT. And so we need more H-1Bs, right? Bill Lerman over at the Urban Institute did some calculations. He said, well, that’s just frictional unemployment. It’s frictional turnover. In other words, you expect a certain amount of vacancies as employers try to fill those positions. So the data’s often kind of difficult to see, and behind that are different stratagems that employers are using in the labor market. The other part of this is the academics whose job is to produce and get tuition dollars. We have a system in NIH that rewards large grantholders using postdocs. We have today close to 150,000 OPT workers in the United States. We have fundamentally changed the nature of how foreign students work and get into the labor market and into the economy in the United States, and that deserves a lot of thought. Well, I could go on and on, but I’m approaching 10 minutes, I believe. MR. KRIKORIAN: No, if you have more to say, go ahead. MR. LOWELL: Well, so, you know, I just want to say that, you know, why foreign workers, then? You know, why? And some of the reasons are fairly obvious, because there is a widespread perception of shortages for the reasons I just mentioned, because of inertia in business models, because we’re not really talking about all Ls (ph) or all H-1Bs or all green carders. It’s a segmented market. Different employers act in different ways. They really have different motivations. And the other thing that’s important is when you go to college fairs, you’ve got very bright foreign graduates staring you in the face. Employers would like to employ them. The labor market’s become both global and very intensively international within the U.S. So these things are a lot of the reasons why employers and others want to hire foreign workers. Going forward, I’m not going to offer a lot of policy advice, but I do think that we have a few factoids, again, that I think many of us think would produce better outcomes, one of which is that permanent visa programs probably are better than temporary. Temporary programs are kept small and targeted towards specific employers, which serve their intended purpose of meeting cyclical shortages, and that not only should it be permitted, it should be facilitated, and we should think about creative ways of doing that. We need to spend a lot of attention on how we manage the transition between foreign student and permanent visa status in the United States. There’s been a lot of policy proposals there. I think they’re well-intended, but we’ve got to think about the management because it’s not easy to do it right. We know how the Australians didn’t do it right. And when the day is done, supply is still an issue. If there’s no clear shortage indicators, then large-scale permanent or temporary probably doesn’t make too much difference. There is some tipping point, and how we figure out where that tipping point is important to how it sends signals out to the labor market on other – underrepresented minorities and others in the domestic pipeline. MR. KRIKORIAN: Thank you, Lindsay. MICHAEL TEITELBAUM: OK, well, thank you. And the previous speakers have said some of the things I have on my notes, so I will not repeat them. I agree with almost everything that was said. I think this is – this paper is a valuable contribution to what is an expanding research literature on this topic. And as the presenter said, it’s been one that hasn’t gotten a huge amount of attention in the political sphere. It’s just been taken for granted that there is a shortage of scientists and engineers, and there should be an expansion of mostly temporary visas for that set of occupations. But the advocacy claims have been pretty much based upon weak or absent evidence, and there’s now starting to be a body of strong evidence coming from a wide range of researchers and organizations who don’t have anything really in common ideologically as far as I can tell. They’re just looking at the data and coming up with roughly the same kinds of findings, in many cases saying they’re surprised by the findings they came up with from the data. They had expected to find evidence of widespread shortages, based on the presumed shortages that are sort of conventional wisdom, and they couldn’t find it. They couldn’t find that evidence in the data they looked at. The findings of this report are broadly consistent with most of the other research reports I’ve seen, and it says – correctly, in my view – that the science and engineering workforce is important, but small. That’s a strange combination, but it’s true: very important, quite small. No credible evidence of general widespread shortages. But I would add – and they do say in there that there is evidence in a few specialized fields. You can find at one time or another, in one place or another – you can find evidence that labor markets are tight, and you can see rising – pressures on rising wages. In fact, you can see some companies taking action to prevent wages from rising by making arrangements on the side for nonpoaching kinds of agreements, which indicates that – it’s illegal, of course, but it does suggest that they had some evidence that wages were going to be or were rising and they had to do something to keep that from happening. But generalizing to the nation or to the entire science and engineering workforce from those kinds of specialized circumstances is quite perilous, but common, because the claims are mostly coming from employers in those particular specialized circumstances. The other thing to say about science and engineering occupations is that the career paths vary dramatically across these occupations. By and large, initial careers are paying higher wages in science and engineering than with – (inaudible) – holders in what are called STEM. I’m going to get that in a moment. I’ll use it for the moment, the STEM concept. STEM graduates do receive higher wages on average than non-STEM graduates. Average real wages in most of these fields have not grown very much, however. So you have – again, it’s complicated. You can’t just – you can’t just make simple generalizations about it: by and large, higher starting wages but slow growth in wages over time. And I was pleased, I must say, in reading this report – actually, I just got recently, so I’ve read it quickly – that the data did actually turn up what anecdotally and more than anecdotally many of us were aware of, which is that petroleum engineering has gone from a backwater of engineering with some of the lowest average wages in engineering for 20 years, with petroleum engineering programs closing down because students were not interested in going into petroleum engineering, to the hot field of engineering, almost overnight – overnight meaning, like, in five years. That’s – nothing happens overnight in this kind of market. MR. CAMAROTA : Something wrong. MR. CAMAROTA: Well, it’s not a huge sample size. MR. CAMAROTA: But we do have 12 years of observations. MR. TEITELBAUM: Right, right. OK, so it’s consistent with what everybody in the petroleum field knows, that all of a sudden, meaning in over a five- to 10-year period, it’s become a hot field. And of course, now what’s happening is enrollments are expanding and graduate numbers are expanding and new degrees and programs are being opened and so on. So we’re going up now. After going down for 20 years, we’re going up in the cycle there. Now I said I was going to say something about STEM, and I’m increasingly uncomfortable with the term STEM. I use it in this book. I actually went through it with a search routine to find out how many times I had used stem, and I thought – there was a count first and I thought, oh, my god, I don’t remember using the term that many times. It turns out it was reading system and counting the times I had used system. If you took off of sys (ph) part of it, then – and I did use system a lot, it turned out – then I did use it – and I forget how many times, but mostly quoting other people, thank goodness. Because I think the term is a – it’s in the eye of the beholder, what it means. The – Lindsay Lowell mentioned some studies coming out of Brookings that are showing, for example, that the STEM workforce, as they define it – they have their own definition of STEM workforce – consist – accounts for 20 percent of the U.S. workforce, so 155 million people. Now that’s an impressive number. And the 5 percent that the National Science Foundation, under their definition, refers to is one-quarter, obviously, of the 20 percent. And how did that happen? Well, they – I won’t go through their methodology, but let’s just say the outcome of their methodology is that people like auto mechanics are counted as STEM workers, or the very skilled craftsmen who seem constantly to be working on my house in Connecticut, the wonderful carpenters who are – you know, well-paid and very, very good people, but they’re counted – I think he would be counted as a STEM worker, under these conditions. And I’m a great – I couldn’t do what he does, but he doesn’t really need a degree to be doing it. Well, he doesn’t have a degree and he doesn’t need one to be doing what he’s doing. OK. Now what about immigration? I already said I have trouble with the STEM word or the STEM acronym. The way this report uses immigration, the term immigration, is common English usage. So it means people who move to the U.S., either permanently or temporarily, but not just visitors. So tourists are not included, short-term visitors are not included. But people who are temporary workers for multiple years are included as immigrants. The U.N. uses a different concept of immigrant, same English word, meaning residence in a country for a year or more. Unfortunately, U.S. law doesn’t use either of those definitions for the same word immigrant. Immigrant in U.S. law means admitted for permanent residence, i.e., with a permanent – legal permanent resident visa, a green card. If you’re not in that category, then you’re what else? You’re a nonimmigrant. If you’re not an immigrant, you’re a nonimmigrant. So many of the people in this study are not actually counted as immigrants in U.S. law. They’re counted as nonimmigrants. I think since the paper is addressing law and policy, they might want to think about clarifying the language. I don’t mean they should change their usage, but they might want to have a little box saying, you know, here, we’re using it this way, and the law uses it this way. Don’t get confused. OK, so I was asked to say a few things about this new book that I’ve just written, that our chair mentioned. And the title “Falling Behind?” obviously indicates that it’s focused on whether the U.S. is falling behind its competitors in science and engineering. And the simple answer is no. The U.S. in these fields is predominant globally. It’s a leader globally. But it’s not as predominant as it was in the first three decades, let’s say, after World War II, three to four decades, maybe. Now what’s happened? Has the U.S. declined? What’s happened is that the European countries, mostly European countries that were devastated by World War II have recovered, and they’ve become prosperous, and they’ve become – they’ve come to invest more substantially in science and engineering and in their university systems. They’ve expanded their university systems. I used to teach in Europe for eight years and – or four years, and studied there. And it’s – there’s no question that the – for example, in the U.K. the percentage of the cohort – age cohort going to university when I was a graduate student there was about 11 percent, and I think it’s now getting on for 50 percent. So they have begun to catch up. Their growth – their improvement, if you will, and performance measures in science and engineering has been more rapid than the U.S. The U.S. has been improving, but more slowly, form a higher level. They’re improving more rapidly from a lower level. China is the most extreme case, improving very rapidly from a very low, very low level. And if you look at the curves, you’ll see some almost vertical changes in some of the measures in China, which look totally different from Europe and different from the U.S.
OK. So this book addresses this question of shortages as well, and the conclusions, I was pleased to see in reading this report, are broadly consistent with this paper. No credible evidence of widespread of national shortages, but a lot of variation across science and engineering fields, across levels of education, across time and across place, and that we can’t find – the book says we can find indicators, as I said before, under supply in some fields and evidence of oversupply in other fields in science and engineering. And the fields go up and down. I’ve already mentioned petroleum engineering, but mechanical engineering is another example of a field that’s gone up and down and up and down. The underproduction – where is there underproduction? Well, I think this is arguable, but my impression is that we may be underproducing technical associate’s degrees. Sub-baccalaureate degrees may be underproducing. Part of that is because community colleges, which are a very important resource in this domain, have been increasingly squeezed financially because they’re heavily funded by state and local governments rather than by research funding, which has been going up. But resources for community colleges have been not going up very fast. And some of them have said, well, it’s more expensive for us to teach in a technical field than in a nontechnical field, and if we want to keep open enrollments, we’re going to have to squeeze down on the most expensive areas in order to keep within our budget. So that’s a perverse outcome, I would say. And the same I think we could say is underproduction in quality master’s degrees in scientific fields, although not in engineering. But in science fields, the quality master’s sector has sort of – it did almost die out, and now it’s reviving, but it’s still got a long way to go to revive. And overproduction, where do we have overproduction? I don’t think there’s much dispute about this – although you would not see it in the political discussions very much – is that we are overproducing Ph.D. and post-doc levels in the biomedical sciences. And the leadership of the National Institutes of Health knows that and says that. It’s not a secret. People don’t know what to do about it, but the system is overproducing relative to demand. And why does this happen? Well, first of all, universities – university system is relatively insulated from the labor market. It doesn’t get good signals from the labor market. And in any case, it is slow – it’s very slow. There are all these lags built into a university system, like tenured faculty and department structure and department and internal politics. But also the incentives within the system are increasingly research, and university faculty respond to incentives, and they seek research funding. They need research assistance to do their research grant proposals and projects, and master’s students and of course community college students aren’t going to be research assistants very effectively. You need Ph.D. students to be research assistants. And then research funding the way we finance it actually provides the money to finance more and more Ph.D. students and more and more post-docs. It’s – I can go into that at some length if you want, but what it means is that if research funding goes up, you’ll have more money for Ph.D. students and for post-docs but not for master’s students and not for – certainly not for community college students. So that’s part of the point of this book. And the result is that parts of the U.S. research enterprise in science especially, and in engineering to a lesser degree, are structured to be unstable. Nobody really intended it this way, but because most Ph.D. students and post-docs are financed by research dollars – it’s 86 percent, by the way, of graduate students supported by NSF, National Science Foundation – are supported by research grant funding, not by their wonderful graduate fellowship program, which is quite small. Seventy-eight percent of Ph.D. students and post-docs supported by National Institutes of Health are supported by research grant funding, not by their training grant funding, which is very high-quality but small. What that means is as research funding goes up and down you’re going to get up-and-down flow – movement in the Ph.D. numbers and the post-doc numbers, and that’s what we’ve seen, with a lag, of course, with a delay. At the same time, graduate students get little information about job markets for Ph.D.s and post-docs, about career prospects. And if American students decide, well, I’ve heard it’s not so great to be a Ph.D. in biomedical fields; maybe I’ll do something else, and there’s a decline in interest or applications but they – the universities really need more graduate students to be research assistants, they have unlimited access to international students. There’s no limitation, no cap on the number of graduate students that can be admitted for graduate study, to be financed by federal research dollars, so that graduate students from abroad don’t have to pay tuition and they get a stipend as well, in order to be graduate students in U.S. research universities. Meanwhile, you have other kinds of incentives that cause universities to think about leveraging up, becoming more active in research. Even if they don’t have the internal resources to do so, what they – the incentives are, first, that they want to try – they try to maximize the percentage of salaries of their faculty, who are paid – or which are paid by grant funding, research grant funding, that I’ve already said they have an incentive to expand the number of graduate students and post-docs to work in their labs, and they also have an odd incentive to borrow money via mortgages or bond funding to build new laboratory buildings and to renovate old laboratory buildings, which I can talk about. It’s not – nobody intended it this way. It’s just built into the way federal regulations are written. There’s an incentive to borrow rather than to own the building as equity, and that’s the way the system works. So the result is a – the system works fine as long as research grant funding keeps rising. If you have a stable increase in research funding of 5 percent a year, say, or 6 percent a year, everything’s fine. But if it goes below 6 percent a year, according to one study, biomedical research in the U.S. is very unstable and goes into crisis. It needs 6 percent minimum annual funding increases to be stable. And this is harmful in many ways. So last point about the book is – I go through in the book a surprising series of cycles of past alarms about shortages of scientists and engineers, going back to World War II. This cycle is pretty typical. It’s typically 10 to 15 years. Somebody sounds the alarm that there’s a shortage of scientists and engineers, or a looming shortage of scientists and engineers. The government eventually – sometimes quickly, sometimes slowly – responds by increasing the production of scientists and engineers via funding, or more recently increasing the visas for scientists and engineers from abroad, and then enthusiasm wanes or the shortage doesn’t appear that was forecast and there’s a bust. And a lot of people who are still in graduate school discover that there aren’t the career paths that they had been advised they might be able to find, or would be able to find, when they graduate because it takes them enough years that they are – they’re behind the curve in terms of a 10- to 15-year alarm-boom-bust cycle. And there are five of these which I can describe later but I think I’ll skip over that now, and I’m going to stop there. Thank you. MR. KRIKORIAN: Thank you, Michael. MR. CAMAROTA: Can I just make two quick comments? MR. KRIKORIAN: Sure, quickly, yeah. MR. CAMAROTA: First, I recommend the book very much. Actually, I had the enormous disadvantage of actually completing the report before I got the book. So I had sent it off to our layout person – it took a long time to lay out because of all the darn tables – and then about a week later, after I’ve already finished and sent it off, I get this great book on my desk, which I knew was coming, but I didn’t see. I guess I should have asked for a transcript or something or a – you know, a draft. And I wanted to just ask the other panelists about a basic point, wage growth. Is there anything wrong with wage growth? If wages were going up fast, that might be a signal of a tight labor market or a shortage. A shortage is not a term an economist would generally want to use, but anyway, I’ll use it here as a common English term. Would that be bad? Wouldn’t that just mean that more people would go into that field, more people would – who aren’t working? We know there are, you know, over a million STEM workers not working who could come back into the labor market. There’s millions, over 5, 6 million not working in STEM. And of course, the supply isn’t fixed because people get training. They can go back to school. They change degrees while they’re in school. Would there be anything bad about rising wages, which of course we don’t even have, but if there were, can anyone think of a downside of rising wages? MR. KRIKORIAN: In other words, why is that something to try to prevent through policy. MR. TEITELBAUM: I can think of a – go ahead, Lindsay. MR. CAMAROTA: But – no, obviously, if I’m an employer, lower wages, better, right, no matter what it is, nonprofit or profit. So I get that. But I mean, from a societal point of view, if STEM workers were experiencing 2 or 3 percent growth in real wages every year for five years, would that be bad? MR. LOWELL: Well, we know that Greenspan has suggested that’s one good way to hold down inflation, by moderating wage growth. And the other answer, I think, is that STEM workers still are – tend to enjoy, as you’ve already pointed out, an earnings advantage over some other professions. So by that metric, you know, a lot of professions have stalled wage growth over the last several years, and STEM is not necessarily unique in that metric. I think the thing that’s different here is we don’t have a fine-tuned public policy to meet putative shortages in the medical field or putative shortages in any other field. We have a very targeted set of programs that tend to be STEM, and particularly IT-related. So I think in that context, the question really is should the government be reading those shortages – shortage indicators and adjusting the numbers appropriately. MR. TEITELBAUM: Well, I’d say – I mean, employers would respond in a variety of ways. And they – you can see it in almost every other case when wages in a particular sector have risen. They would change, to some degree, the structure of production of whatever their product is. And you can see that happening in the health care system, with the devolution of certain functions from more highly skilled to less highly skilled workers who get lower pay. There would – there would be a couple of problems that would arise. I think one of them would be – it would depend on how fast this happened. If everything is gradual and isn’t an enormous boom and then an enormous bust, which is the way the IT industry tends to behave – if there were a gradual increase in wages, then you would – first of all, you would see, as you said, probably more kids, over time, attracted to major or to stay in majors that that they’ve already decided to do in those fields, to go on for additional study. But that – there’s a delay there. There’s a lag. It takes time to get a degree. So you wouldn’t get an immediate supply response from the education sector. You would get an immediate response, I think, from the pool of already educated but not science and engineering-employed people, but they might – their skills might be somewhat outdated if they were working as an insurance person or something. They would have to catch up, so there’d be, probably, in that case, a relatively short delay, not a multiyear delay, but it might be six months or three months or whatever for them to catch up on the new technologies that they weren’t working in for the past three or four or five years. There would be some additional incentive for employers, in addition to the many incentives they have now, which are tax incentives and cost incentives and a whole range of incentives, to offshore some of their activities, particularly the lower-productivity activities, but there would be an additional incentive. I think the incentives are so strong now that it wouldn’t make a huge amount of difference, but there – you ask, would there be any negative? Yeah, I think there would be a – there would a modest additional incentive to off-shore if wages were rising in the U.S. in these fields and not rising in, let’s say, India and China, which they are. They are rising in India and China. So it would be a relative question. That’s the way they would think about it. MR. CAMAROTA: Yeah, for the off-shore question. MR. CAMAROTA: But is it – is a matter of policy that we would like to see not so much wage growth? I mean, is that – does that seem – it seems kind of odd to sort of argue that one goal of government policy should be to make sure wage growth is pretty darn low. It’s kind of hard to make that – it’s certainly hard to make that case publicly – though people do. Elected officials generally don’t. (Laughs.) But others might. Anyway. MR. KRIKORIAN: OK. Let’s take some questions. Please wait till the microphone – Paul first and then Jack. Please – yeah, identify yourself. Q: I’ll put in the commercial – the people who actually invented the Internet. (Laughter.) I’m going to ask the panel – picking up on something Michael said – two think inside the box for a moment. Years ago I used to correspond with the late Milton Friedman on this stuff, who told me something – a word economists do use – not shortage, but subsidy. He said the H-1B visa is a subsidy because it enables American employers to get workers cheaper than they would otherwise have to pay to get them. I specifically ask him and he declined to say that a supply of skilled workers on green cards was a subsidy for reasons that you’ve all mentioned but not quite discussed. I appreciate the abstract potential that an oversupply of free agents in the economy, particularly in fields like STEM, might have for, you know, as you say, increasing the price. And so they would go someplace else to do the work. But of course, that’s what more than half the H-1B program is now doing explicitly – not because prices are rising but because H-1Bs who are here, particularly for outsourcing companies, are substantially underpaid relative to the American market. So it seems to me that a question that really ought to be much more clear in this discussion, as in others, is the distinction between green cards and guest worker visas. I mean, I heard Steve say that when PBS finally spoke about this shortage question they titled their program, “How Guest Workers Undercut U.S. Wages and Working Conditions.” I heard Lindsay note that this is a mobile labor market, but it’s certainly not mobile for guest workers because that’s why they’re guest workers. So I’m curious, asking you guys to think inside in the box, to think about the disincentive to hire Americans coming out of school because they’re not indentured, and to prefer foreign students on optional practical training and then on H-1Bs for years and years before they ever become free agents. Why not focus the research on the distinction between guest workers and green card holders as free agents, instead of just the broader supply question? MR. CAMAROTA: Well, I mean for me, you still have the fundamental question, are the workers needed in the first place? The circumstances they come in may matter a lot. And it’s worth certainly thinking about, you’re right. But the question is, if you have – if one-third – only one-third of your currently trained STEM workers actually get a STEM job, if you have a situation for year after year of very little wage growth, there’s pretty strong evidence you don’t need them whether they’re guest workers or green card holders. It doesn’t – it doesn’t seem like that is the central question. The real question is, do we need the workers in the first place, at least for me, and that’s the question I’m mostly interested in. And then you could decide whether a – what the mix should be of guest worker or green card holder. MR. TEITELBAUM: Well, I would say that the way the legal immigration system is structured – which is an artifact of the 1965 immigration reform and subsequent amendments, I think it undervalues skills and overvalues extended family ties. It was designed to do that – in ’65 – that was the intention, for reasons unrelated to what is now given as the explanation of that kind of tilt. But it’s something on the order of 140,000 visas for employment-based purposes, which include family members, as I recall, versus a million-plus total permanent admissions per year. That seems out of whack to me. And again, if you want to compare U.S. K-to-12 to Canadian K-to-12, where the U.S. doesn’t look very good, on average, you should compare that percentage as well in the Canadian system versus the American system, and you’ll find that there’s much more emphasis in the Canadian immigration system on skills than there is in the U.S. system. So I have no problem myself with shifting that balance within the permanent legal immigration system incrementally. Everything should be done incrementally and not hugely dramatically. I mean, it shouldn’t go from 14 percent, say, to 80 percent, but it should be more than 14 percent, I would say. MR. LOWELL: Yeah, I’d just say – (inaudible) – toward the end of my comments that the permanent tends to be preferred over temporary, but I agree with Steve that at some point, if there aren’t any evidence – if there’s not really evidence of widespread shortages, large number of permanent may not do you any better than small numbers of temporary, so that there’s a tension there. I’m not saying I have the answer, but smaller temporary programs are probably better. At the same time, there’s some thinking about moving toward a system that has provisional-type visas, and that’s partly what the European does. And the idea there is that the H-1B, to some extent, already operates as a provisional visa. That is, yes, they’re earning a little bit less at the outset, but some of the research I’ve done suggests that H-1Bs who transition to green cards actually earn more than people who come in on green cards, so that there’s some kind of, you know, process of vetting people through the provisional type of system that H-1B could be. You know, I just throw that out there to think about. I think – I agree with – very much with Paul (sp) about one thing. We don’t have enough research to answer these questions with a lot of nuance – and I think there’s a lot of potential nuance out there – other than the fairly obvious, that permanent is usually better than temporary. MR. KRIKORIAN: Yeah, Jack (sp) next, and then Yuna (sp). And keep the questions economical. Q: One just very quick observation in response to Steve’s question. Sure, there’d be a downside to the increase in wages for high-tech workers. It would add to increasing income inequality in the United States because they’re high-wage workers already. But I don’t think that’s a justification for increasing the flow of foreign high-tech workers. Secondly, with regard to Michael’s point with regard to immigrants, as opposed to temporary workers, if I understand the data correctly coming from the ACS, it’s foreign-born rather than immigrants. It includes long-term nonimmigrants as well as – as well as immigrants. So that’s not really an issue. But the question is would you – what was not really discussed was the issue of ageism. And I think that that’s an important issue with regard to the flow of high-tech workers coming into the country. On one hand, you hear the stories about high-tech workers having to train their foreign replacements because they’re being laid off in favor of the cheaper workers, the difficulties of older high-tech workers being able to get jobs. On the other hand, you hear the arguments that high-tech worker is an evolving field; you need younger workers that are trained more recently in the issue in the field, and therefore it’s a justification for discriminating in favor of younger workers. I wondered if you’d comment on that, please. MR. KRIKORIAN: Under the age of what, 20? MR. CAMAROTA: Thirty, I’m sorry, 30. (Laughter.) There’s some very smart people out there that – (laughter) – under the age of 30 who have STEM degrees, so they couldn’t have had it for that long, their rates of having STEM jobs are very low, like a third. So there – ageism is an issue. MR. KRIKORIAN: Do you guys have anything to add on that? MR. TEITELBAUM: Well, I think that – I didn’t really talk about this in my book, but I think there is some evidence that’s convincing that in some fields, in some industries, there is a strategy of – particularly if these are boom/bust industries – when there’s a bust, the people who – there are massive layoffs but the layoffs are differentially of the older, more senior technical workers. And when the boom cycle reappears they find themselves in a situation where it’s very difficult to get rehired back into the industry in which they started as a young professional and aged into middle age, meaning 35 – (laughter) – or 40 and then got laid off. They find it very difficult to get rehired because there is an ample supply of young, lower-cost workers mostly coming from these temporary visa programs. So that’s their claim, and the evidence is mixed. I mean, it’s hard to get it from ACS-type macro data, but the evidence that I’ve seen is relatively convincing that that does indeed happen, but not in all industries. It’s industries especially like IT, I would say. Q: Yeah, I – is this on? Q: I don’t know. OK. I’m Beryl Benderly from Science Careers, and I’d just like to ask you all what you make of Senator Sessions? I mean, is he just a guy who happens to be able to be convinced by actual evidence or does this indicate something about Republican thinking possibly shifting or something? MR. CAMAROTA: Yeah, what’s striking about Senator Sessions, unlike almost everyone else in the Senate, is he actually gets that there’s no labor shortage in the United States practically of anything. Why does he stand out? Does he have some special ability to just look at BLS data that no one else has? (Laughter.) I don’t know. You know, I testify fairly often on other issues like low-wage labor markets, which look terrible in terms of the share of less-educated people working, the share who have to work part time, their wages. All look terrible and yet – I always say this – the only place where there seems to be a labor shortage in America is in the halls of Congress. That’s the – they just accept that argument. And for whatever reason, Sessions has taken the time to actually look at the data and say, hmm, we have record numbers of people not working, no wage growth for 14 years across the economy. I don’t – but why does he? And Democrats – you’d think Democrats, right, would look at a skeptical eye every effort to increase immigration, and they don’t anymore. They used to, historically, but they don’t anymore. And it’s a fascinating question but I don’t have an answer as to why he’s able to read data and the rest aren’t. MR. KRIKORIAN: I mean, the only thing I’d actually say on that is that is that I think it’s really part of a larger debate among Republicans about it. In other words, what direction should the party take? Should it be more sort of populous and oriented toward the concerns of middle-class and working-class people or not? And that – in other words, it’s part of that ongoing debate that this ends up kind of being part of. Q: So it might actually mean something, maybe. MR. CAMAROTA: Do we have more time? MR. KRIKORIAN: Well, just for a – just brief answers. MR. TEITELBAUM: It wasn’t 20 years. MR. KRIKORIAN: Huh? Yeah, it was 20 years ago. MR. KRIKORIAN: Lindsay was director of research for the commission. And my question is – you obviously looked at these same questions back then. What’s changed? Has anything changed? Have you guys learned anything over the past 20 years that the commission people didn’t – the commission didn’t know at the time about science and tech immigration? And it’s a big question and I just want a short answer, but I just wondered if there’s anything – from your perspective, two decades later, whether there’s anything that you’ve learned. MR. KRIKORIAN: Yeah, but, I mean, you were working. You were working still in ’94. MR. TEITELBAUM: Yeah, we were working. Yeah. And I think it’s still valid. What it said for ’97 is still true today. I actually reflected some of it when I said that 14 percent of employment-based visas is not a high enough percentage of total permanent visas. That was one of the recommendations of the commission. I think where the commission did not really pay much attention for reasons I can explain was to the student visa policies and their penumbra of other visas, like the – well, I would say, to some degree, the H1-B is a kind of – it’s related to the student visa. There are a whole range of different visas that are somehow related to the education system, and the commission didn’t have a consensus as to whether it should even look carefully at the student visa nexus, and it operated - Barbara Jordan’s view was – I remember her wonderful line at the beginning was – we may be nine in number, but we are not the Supreme Court. (Laughter.) So a recommendation voted by five to four by this commission is worthless. We have to – we have to – we have many – too many issues to deal with. We need to agree on the issues that we think, by consensus, we need to address, and then we have to see if we can reach agreement. And all the recommendations, with a couple of exceptions, were unanimous – 9 to 0 as a result. But we didn’t deal with the student visa system, and I think probably many of the commissioners would say, in retrospect, that was a mistake, but we didn’t know in ’96 and ’97 that student visas would turn out to be so relevant and grow so rapidly, because they have no constraints on them. They – as we were just discussing. Lindsay, do you remember the same thing? MR. LOWELL: Yeah, no, I think that’s an adequate reflection. I mean, again, my – I think one thing that has changed is, a lot of the perspectives on some things have become more entrenched so that when we were looking at skilled migration back in the ‘90s, the issue of skill shortages – STEM shortages wasn’t as prevalent as part of the conversation; it’s become a backstop to the conversation now. There wasn’t a lot of discussion about foreign students, I think, in part because the numbers were a lot smaller, and it had become integrated into this more evolved system now that we see. So I think a lot of things, in some ways, moved beyond where the commission were. The same basic dynamics, but a lot more to it. MR. KRIKORIAN: Well, thank you. I want to respect peoples’ time, and we’re going to wrap it up. I think everybody is available to be accosted, although maybe not, afterwards. I appreciate everybody coming. Again, the report is online at cis.org, assuming the website is back up and working, and I hope to see you at our next event. Thank you.